The kindest! Everyone in the office was lovely! I get nervous seeing gynos I’ve never been to before and my entirevisit here was lovely. I felt listened to and taken care of. Highly recommend. The kindest! Everyone in the office was lovely! I get nervous seeing gynos I’ve never been to before and my entire visit here was lovely. I felt listened to and takencare of. Highly recommend. Although I was late for my appointment the staff didn’t turn me away so I was ver happy about that thestaff and Dr Ashford was a very friendly staff. I will come again. Although I was late for my appointment the staff didn’t turn me away so I was ver happy about that the staff and Dr Ashford was a very friendly staff. Iwill come again. 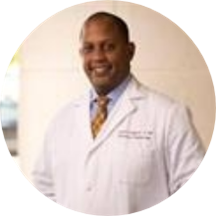 Dr. Rowell Ashford is a caring and reputable obstetrician and gynecologist caring for the Birmingham, AL community. Dr. Ashford attended the University of California, San Francisco, where he earned his degree in medicine. He completed his residency in obstetrics and gynecology from the University of Alabama. Dr. Ashford is a part of Baptist Health Centers - Princeton OB/GYN and is board certified by the American Board of Obstetrics and Gynecology. Dr. Ashford is devoted to ensuring the longevity of his patients’ health and developing long-lasting relationships with them. He takes his time to understand symptoms and give correct diagnoses to ensure the continued health of all his patients. It was a very pleasant gift and informative. This was my first visit and I was very anxious and fearful (just my nature with new people). He was very kind and patient and put me at ease. He’s very knowledgeable. It was fast but professional! I normally do not enjoy going to doctor appointments especially this being my first time to see Dr. Ashford. Dr. Ashford, however, put me at ease and was easy to talk to about any concerns I had. Great doctor, very professional, and informative! I would recommend this office to others with confidence that they would receive very good care.